In fact, it's not the traditions of a foreign society but 21st century America that Witting's play likens to the social norms of 16th century England. The sexism is just more subtle. 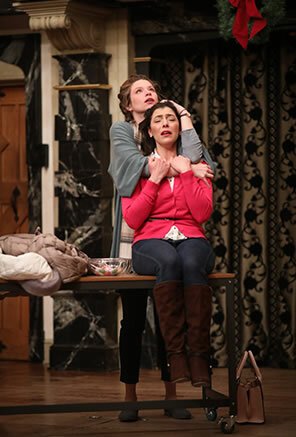 Anne Page (Meg Rodgers, back) hugs her best friend, Courtney Ash (Abbi Hawk) in the American Shakespeare Center's world premiere production of Amy E. Witting's Anne Page Hates Fun at the Blackfriars Playhouse, the first production of the theater's Shakespeare's New Contemporaries program. Below, Aaliyah Essam (Shunté Lofton) protests forced marriages; and Janice Sanning (Rick Blunt) talks with her husband, Boyd (Calder Shilling, back). Photos by Lindsey Walters, American Shakespeare Center. So many mysteries to be answered. What serious illness is killing Courtney? Who was driving "the other car" that killed Charley's parents? And why does Anne Page hate fun? The real suspense this evening at the Blackfriars Playhouse in Staunton, Virginia: Will this play in any way and in every way be measured a success? So much more is riding on that mystery than those posed in the play. Amy E. Witting's Anne Page Hates Fun won the first of 38 playwriting contests in the American Shakespeare Center's ambitious Shakespeare's New Contemporaries initiative to pair each William Shakespeare play with a new piece inspired by that play. For her take on The Merry Wives of Windsor, Witting won the $25,000 prize and the opportunity to have her work premiere as part of the Actors' Renaissance Season at the Blackfriars in repertory with Merry Wives and Henry IV, Part One (Arden of Faversham joins the rotation in March). In the first year of the Shakespeare's New Contemporaries program, 189 total scripts were submitted for two plays, Merry Wives and The Winter's Tale (the other winner, 16 Winters, or the Bear's Tale by Mary Elizabeth Hamilton, will open May 11 as part of the Blackfriars spring season). Witting triumphed in having her script selected out of that initial batch, but the stakes are exponentially higher tonight: Her play has to win over a paying audience at the Blackfriars and serve as a herald for the potential worth of the entire Shakespeare's New Contemporaries effort. You can't use standing ovations as a measure because they are an everyday occurrence at this playhouse. However, out of the din, I hear someone shout "Author!" something I've never heard here or anywhere before. In this playhouse, the world's only re-creation of Shakespeare's indoor theater specializing in plays by the Bard and his contemporaries, calling for the author is, in itself, significant. Gathering our stuff to leave, I glance back at Amy Wratchford two rows behind us. She is the managing director of the American Shakespeare Center (ASC) and put incredible effort, faith, and financial wherewithal into Shakespeare's New Contemporaries. She's looking at me, awaiting my reaction. I flash her a thumbs up. Anne Page Hates Fun is high-quality work, better than most new plays I've seen this decade. Witting has given us a cleverly comical and richly insightful portrayal of small-town America, death and living, women's empowerment, and flamingoes. The audience's laugh track is near constant, yet moments move us deeply, even inspiring my wife to tears, which is seldom the case (I'm the theater weeper in this marriage). The play is set in the small town of Windsor, New Hampshire, and the characters are Shakespearean in detail and so exquisitely presented by the cast that by play's end we feel like we're residents of the town, too. The script has many memorable lines and engaging dialogue, and the interweaving plotlines are singly engaging as they wind into a powerful whole. This new play also reflects—and reflects on—Shakespeare's Merry Wives, not in characters and plot but in themes and social commentary. Witting weaves the circumstances of Shakespeare's Windsor women—Anne Page and her mother Margaret Page and mom's best friend Alice Ford plus the doctor's housekeeper Mistress Quickly—into her own Windsor women without cribbing Shakespeare's plot. And with no Falstaff. That last point is significant in the larger scope of Shakespeare's New Contemporaries. Anne Page Hates Fun sets a standard in quality and in purpose as a conversation between a modern playwright and Shakespeare. These are to be plays "that vibe off Shakespeare," as then-Artistic Director Jim Warren put it when ASC launched Shakespeare's New Contemporaries in April 2017. "We're not looking for a retelling of Shakespeare plays," Warren said. "We're looking for partner plays that are inspired by Shakespeare. "Anne Page Hates Fun can play in any theater, not just Shakespeare companies, with or without Shakespeare's play. You are not required to know The Merry Wives of Windsor to enjoy Witting's play, though familiarity with Shakespeare's work does make experiencing Witting's all the richer. Measuring the success of Witting's script comes with the caveat that the Actors' Renaissance Season company members helped forge the final product. Traditionally, the ASC's "Ren Season" replicates the production principles of Shakespeare's times: a troupe of a dozen or so actors create a repertory with only about five days of rehearsal for each play and without a director or production team. That process is in effect for the other three Ren Season plays, but because Anne Page Hates Fun is a world premiere of a new script, ASC assigned Stephanie Holladay Earl, a veteran Blackfriars actor and director, to helm the play through an extended schedule of rehearsals and previews. I heard from several sources that the script evolved significantly. Nevertheless, this play did not go through the usual process most new plays do, with workshopping and countless readings. The abbreviated production cycle for Anne Page Hates Fun with Ren Season–capable actors taps into the dynamics of how Shakespeare's scripts might have evolved with his company, creating texts that ultimately formed much of the First Folio. Witting participated in the process—another dimension in being Shakespeare's new contemporary. Much credit also goes to a behind-the-scenes hero, Anne G. Morgan, the American Shakespeare Center's literary manager and dramaturg, who has been shepherding the Shakespeare's New Contemporaries program and liaised with Witting on revisions. 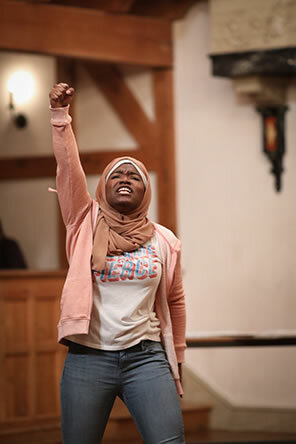 The play introduces us to the small town of Windsor through the eyes of Aaliyah Essam (Shunté Lofton), a foreign exchange student who wears a hijab. Windsor is preparing for its annual First Thursday in December celebration, and as the residents go about their tasks, Aaliyah, in the tradition of Our Town's stage manager, identifies them for us. There's Anne Page (Meg Rodgers) and her parents, Carol (Karen Kopryanski) and Henry Page (John Harrell), the town's mayor. Every small town has a peculiar character, and Windsor has Fred Allenton (David Anthony Lewis), who always speaks in rhyme. We have no idea why Fred is an incessant rhymer (and it annoys the townsfolk, too), but it provides an ironic contrast to his nephew, Charley Garvey (Chris Johnston), a professional writer who has been suffering years' long writer's block. Charley has been absent from the town in which he grew up but came back to take care of his Uncle Fred during his bout with cancer. Charley's parents were killed in a traffic accident when he was a teenager, and he planted a tree in their memory (represented by brown and tan ropes wrapped around one of the Playhouse's pillars with branches protruding from the base of the balcony above). Charley, Anne, and Courtney Ash (Abbi Hawk) were best friends growing up and are still close. Courtney is now married to Fred's doctor, oncologist Steven Bush (Brandon Carter), whose nurse is the effusive and commanding Janice Sanning, wife of the town's sheriff, Boyd (Calder Shilling): "Everything's fine here, Boyd, you get back to the jail!" 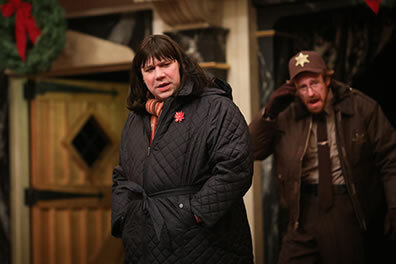 Janice is played by Rick Blunt in a tour de force performance. Blunt also is playing Mistress Quickly in this repertory, so I'll elaborate on his rep-wide work in my review of the other Windsor play. Courtney, we learn in this play's first half, has terminal cancer, which becomes the plot driver while her two friends grapple with their own damaged psyches: what had caused Charley to run away, what had caused Anne to give up a singing career to stay in Windsor to become a high school English teacher, and refuse to have fun. That Witting uses a Muslim girl as our observant guide into small-town Americana is a smart device and establishes Aaliyah's link to Shakespeare's Anne Page; she is facing an arranged marriage with a boy she barely knows. This First Thursday in December happens to be Aaliyah's 17th birthday, and the town celebrates that, too, with her mother, Nour Essam (Alexandra Stroud) showing up. Nour's arrival is more than a birthday surprise, though; it's an effort to get her daughter back on the right cultural track after Aaliyah, following Anne's advice, has applied to a college in Boston. Aaliyah doesn't want to go back home to a life of servile wifely duty, and she eventually organizes a protest against forced marriage with the help of the town's residents (they'll use any excuse for a social event). During this event she Skypes her father, Khaled (KP Powell), introducing him to the character and characters of Windsor while arguing for her desires. The event, however, is hijacked by a plot turn involving Courtney. Doubters may question how a play can "vibe off" The Merry Wives of Windsor without focusing on Falstaff or Ford. That's Witting's point. The Merry Wives of Windsor is not about Anne Page, "but it should be," says Witting's Anne Page, who must teach the play (over her objections) because Shakespeare's play about Windsor, England, is a curriculum requirement in Windsor, New Hampshire. Anne first made her argument in her own paper on the play as a student in Vernon Kunze's class (Shilling playing Mr. Kunze in flashbacks). The exact same sentiment is now being expressed by Aaliyah: Discussions about The Merry Wives of Windsor criminally overlook Anne Page, whose destiny is being dictated by her parents and a society intent on selling her virginity to the highest bidder via an arranged marriage. "If men came from the womb of a woman, why are they so dismissive of women?" writes Aaliyah in her paper, expressing her own frustration. Witting might seem to be comparing modern Muslim societies with 16th century England's restrictions on women, but her play is not that simple. Nor is Shakespeare's. The historical record (not just legend) suggests Shakespeare wrote The Merry Wives of Windsor, or at least the pageant at the end, on commission for Queen Elizabeth. It is a proto-feminist play. Anne Page's parents may not give her any agency, but Shakespeare does, having Anne beguile her parents and marry the man she loves, Fenton, bringing home the moral of both the play's subplot and main plot: "In love the heavens themselves do guide the state." Witting gives Aaliyah agency, even after Khaled comes to Windsor to join his wife in reining in their daughter. When Aaliyah receives notification that she has been accepted into the college in Boston, Khaled learns it's not just any college in Boston and immediately embraces Aaliyah's ambitions, making clear that his daughter's well-being has always been his goal. Still, he's bothered by some of the bad language habits Aaliyah has picked up in Windsor. In fact, it's not the traditions of a foreign society but 21st century America that Witting's play likens to the social norms of 16th century England. The sexism is just more subtle. Anne Page in Witting's play is given less agency than Anne Page in Shakespeare's play. Carol Page pressures her daughter to get married because she wants grandchildren. Courtney essentially forces Anne into a marriage. Courtney is well intentioned because she sees true love in the match, but the betrothed is the one who makes doubly sure Anne means "I do" before she says, "I do." The question Anne constantly fields, and the basis for the play's title, is why she never smiles when she used to light up the town. Everybody, including Aaliyah, thinks Anne is sad because she has never married. The real reason is the opposite. As a young woman, Anne discovered that her smile was taken as an invitation to be sexually assaulted. Courtney is the image of domesticity. She loves married life, she is president of the Windsor Garden Club of which she's the only member ("That doesn't mean I can neglect my own meeting," she tells her husband), and she always dreamed of being a queen. The town fulfills that wish in the uniquely Windsor way we've come to expect, and like Queen Elizabeth in that other Windsor, Courtney leaves a lasting legacy through her power to command. Courtney has a fetish for flamingos, too, but not for kitschy reasons. She once saw a flock of flamingos flying, something she didn't know they could do. "If I had another life," she says, "I'd like to be a flamingo because they surprise you by their flight." It's a vision Courtney hitches her own psyche to as she heads down the path of terminal cancer. Witting's script delves into the dichotomy between dying lives and dead lives. "It's amazing what happens when people learn they are going to die," one character says. "They start living." Flamingos in flight further serve as an image for feminism. Anne had been a flamingo in flight but had her wings clipped by a man assaulting her; by contrast, Aaliyah takes flight right before her approving father's eyes. Flamingos also become a visual allegory in the play, all the way to the last scene when pink feathers float down from the heavens. The character parallels between Witting's and Shakespeare's plays are subtle. The casting clues us in on a few. Best friends Anne and Courtney are played by Rodgers and Hawk who play, respectively, Mistress Page and Mistress Ford in Merry Wives. The great chemistry the two actors display in Shakespeare's play they replicate in this play, and in a universally superb cast, Rodgers does the heavy lifting with her character portraying a dichotic life in the present versus flashback. Lofton playing Aaliyah in this play is Anne Page in Shakespeare's. Mayor Page shows a bit of jealousy as rhyming Fred good-naturedly courts Carol Page, and she appreciates the attention. This points to Ford and Falstaff, except that in Merry Wives, Harrell (Mayor Page) plays Falstaff, and Lewis (Fred) plays Ford. Spoiler alert: Chris Johnston plays Fenton in Merry Wives and repeats a couple of his lines from that play in this play (then, too, he also plays Shakespeare's Justice Shallow). Both plays have a doctor, but Carter's Steven Bush is a steadily dutiful force, more like the Pastor Hugh Evans he plays in Merry Wives than the Doctor Caius that Shilling plays as ridiculously French. Shilling plays Boyd as an older Barney Fife–like sheriff. Blunt plays the doctors' women in both plays, housekeeper in Shakespeare and nurse/receptionist in Witting, delivering the line that best sums up the personality of Windsor. "There's a lot of love in this town. Sometimes it comes out sideways."